"The first edition of this Handbook is built on surveys by well-known figures from around the world and around the intellectual world, reflecting several different theoretical predilections, balancing coverage of enduring questions and important recent work. Those strengths are now enhanced by adding new chapters and thoroughly revising almost all other chapters, partly to reflect ways in which the field has changed in the intervening twenty years, in some places radically. The result is a magnificent volume that can be used for many purposes." "The Handbook of Linguistics, Second edition is a stupendous achievement. 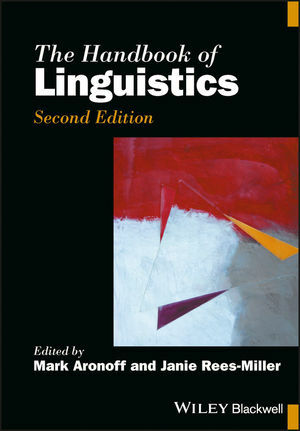 Aronoff and Rees-Miller have provided overviews of 29 subfields of linguistics, each written by one of the leading researchers in that subfield and each impressively crafted in both style and content. I know of no finer resource for anyone who would wish to be better informed on recent developments in linguistics." "Linguists, their students, colleagues, family, and friends: anyone interested in the latest findings from a wide array of linguistic subfields will welcome this second updated and expanded edition of The Handbook of Linguistics. Leading scholars provide highly accessible yet substantive introductions to their fields: it's an even more valuable resource than its predecessor." "No handbook or text offers a more comprehensive, contemporary overview of the field of linguistics in the twenty-first century. New and thoroughly updated chapters by prominent scholars on each topic and subfield make this a unique, landmark publication." This second edition of The Handbook of Linguistics provides an updated and timely overview of the field of linguistics. The editor's broad definition of the field ensures that the book may be read by those seeking a comprehensive introduction to the subject, but with little or no prior knowledge of the area. Building on the popular first edition, The Handbook of Linguistics, Second Edition features new and revised content reflecting advances within the discipline. New chapters expand the already broad coverage of the Handbook to address and take account of key changes within the field in the intervening years. It explores: psycholinguistics, linguistic anthropology and ethnolinguistics, sociolinguistic theory, language variation and second language pedagogy. With contributions from a global team of leading linguists, this comprehensive and accessible volume is the ideal resource for those engaged in study and work within the dynamic field of linguistics. Mark Aronoff is Distinguished Professor of Linguistics at the State University of New York at Stony Brook, USA. His research touches on almost all aspects of morphology and its relation to other aspects of language. He is a member of a team studying a newly-created sign language, Al-Sayyid Bedouin Sign Language, and he has served as Editor of Language, the Journal of the Linguistic Society of America, and as President of the Society. He is a Fellow of the American Academy of Arts and Sciences. Janie Rees-Miller holds the William R. and Marie Adamson Flesher Chair in the Humanities. She established the ESL Program at Marietta College, USA and has served as its director for over 20 years. She has also taught linguistics courses for undergraduates and acted as an editor with Mark Aronoff of Contemporary Linguistics (2009), now in its seventh edition. Her research interests include second language pedagogy, pragmatics, Native American languages, and making linguistics accessible to non-linguists.